Photo (source): The administration building. Wisconsin has a strong cultural background in agriculture. One of Wisconsin’s first attempts at providing technical education resulted in the Milwaukee County School of Agriculture and Domestic Economy in Wauwatosa. The site of the former high school enjoys protected status on the National Register of Historic Places, State Register of Historic Places, and is a Milwaukee County Landmark. According to the Google Map above it may look like there is plenty of activity at the location, but in reality the buildings have been long abandoned. The roads leading up to the campus were stripped away after the satellite image was taken. In 1912 Milwaukee County had the largest rural populations in the state and opened the School of Agriculture and Domestic Economy. 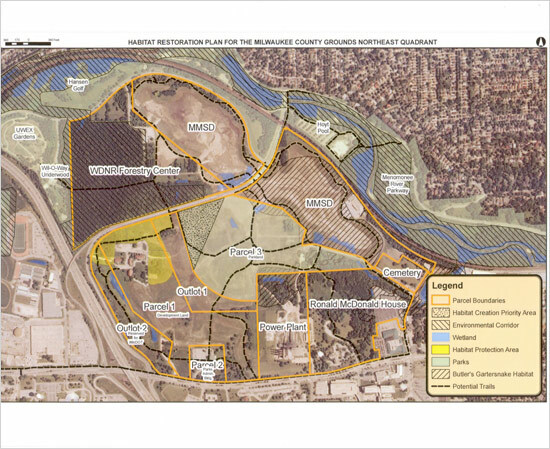 To build the school the county purchased 206 acres of land five miles west of downtown Milwaukee for $72,100 (or $350/acre). Milwaukee architect Alex C. Eschweiler was tapped to design the main campus Neo-Gothic style facilities. Structures for the school include four class buildings, one administration building, a dormitory, power house, barn, greenhouses, poultry sheds, and other smaller buildings. Photo (source): The five buildings designed by Eschweiler. The building to the far right in the photo has been demolished. The high school focused on areas of study specific to agriculture. Students were given hands-on technical training, such as this practical example of how to build a farm shed. Graduates of the school were given a leg up for enrollment in the University of Wisconsin System thereafter. Milwaukee Country residents could attend the school free of charge, while non-residents paid $27 for tuition. Heavy advertising and early momentum lead to strong enrollment for the 1912-13 school year with 243 students. By the next 1913-14 school year, however, enrollment dropped to 206. 1914-15 saw enrollment precipitated further to 191. Average class attendance rates were even less than that ranging from 118-146 (source). Attendance dwindled continuously until 1928 when Milwaukee County concluded that it could no longer justify the cost of operating the school. Photo (source): The area around the campus buildings has incredible biodiversity. In 2007 then county executive (and current WI Governor) Scott Walker (R) opened the buildings for use by SWAT officers to host a training conference. This decision drew the ire of local preservationists attempting to save the location. One report states that paintballs were fired and caused damage to some of the interiors. As of December 2010 the University of Wisconsin Milwaukee made a significant move to develop the site as an Innovation Park. The UWM group plans on making installments totaling $13.55 million to be paid by 2014. The Eschweiler designed buildings are expected to be sold to a private group for conversion into apartments. There are skeptics that have been quite vocal about the infeasibility of the impending sale. For better or worse, the sale of the property mandates renovation of the Eschweiler designed buildings. Another groups of environmentalist critics seek to defend the property because it is part of the threatened Monarch Trail. Photo (source): The monarch butterfly uses the yellow shaded portion that borders the school as a stop on their migration towards Mexico. Photo (source): Beautiful park area surrounding the school. While researching this location online sources mention that these buildings were later used as a tuberculosis clinic and/or mental hospital. The location is often conflated with the Muirdale Sanitorium, which is now a part of the Milwaukee County Research Park. Groups interested in preserving the location make no mention of the location being used for medical activities when writing about the history. Another general misunderstanding about the former School of Agriculture buildings involves the closest structure to the site, which is currently occupied by the Milwaukee County Parks Department. This structure actually used to be the location of the the Milwaukee Home for Dependent Children in the 1940’s. These mistakes are forgivable, but the websites that claim the School of Agriculture is haunted do this location a severe disservice to its history. The campus buildings have signs stating that the area is under surveillance. The doors are either bricked off or bolted shut. To prevent access even the highest windows are boarded up. When I first visited in April of 2008, however, one of the doors was wide open. We wandered through the building and found mostly emptiness. Unfortunately my point and shoot camera battery died, so I don’t have very many photos. The ones that I was able to take are of poor quality due to the darkness. After we explored the first building I wondered about how we could make it into the others. My gut told me that each building may be connected via a network of tunnels. We went to the basement and my instincts proved to be correct. There really wan’t a whole lot left on the inside. Some of the buildings had power and a few lights on. One had an operational telephone closet running in it. The most interesting though was the administration building. At the very top is a beautiful chapel, which has been covered in graffiti. I returned a few months later in 2008 only to find my means of ingress had been bolted shut. Whatever the future has in store for this location the park area is a great place to spend an afternoon. All Business – Article detailing SWAT exercises at the location in 2007. Davide Jackson – Great infrared photos of the school. Google Books – History of Milwaukee entry on Alexander Eschweiler. Google Books – 1911 US Office of Experiment Stations bulletin noting the agriculture school. Google Books – 1915 Milwaukee County School of Agriculture report. Google Books – Industrial Arts Magazine describes a student led farm shed project. Google Books – American Poultry Advocate describes some of the farming activity on the grounds. Google Books – Wauwatosa Historical Society book with a photo of the school. JSOnline – Discusses the future plans of the site. JSOnline – Discusses monarch preservation efforts by environmentalists. Milwaukee Country Historical Society – Page on Wauwautosa landmarks. TMJ4 – Report of damage caused by SWAT training. Wauwautosa Now – UWM sale requires renovation. Some info on these buildings: After the County Ag school closed, the entire campus was converted to the annex for the Home for Dependent Children. It was used to house younger kids, while the older ones stayed in buildings adjacent to what is now the Parks Dept Building. The annex’s admin building had kitchens, dining, school rooms and offices, plus the chapel on the third floor. East of it was the girl’s cottage, which was torn down (a tunnel still leads north to where it stood from admin’s basement). The two large buildings to the south were the boy’s cottage and the staff residence. The smallest building to the west was for new arrivals. Unlike the others it was not connected by tunnels. Thanks for confirming this. My mom told me that she used to visit there when she was a little girl. Do you happen to know where I could find the records of the children that were housed in the Milwaukee Home for Dependent Children during the 1940’s era ? … I have tried contacting the Milw. Historical Society, they say that the records were burnt in a fire in 1981 …I still think that the courthouse may have these records, nobody seems to provide me with a definate answer. Finally found this page again after a couple years…the info I got was from a lady I work with who stayed in the buildings as a child during a parent’s illness. She knew of my interest in the buildings and was curious herself so she went to the Parks Department building on Watertown Plank Rd. and got a bunch of info from the workers there. I’m not sure if they have a list of residents or anything like that but they do have a lot of info on the buildings themselves. There is also a sort of scrapbook put together by a former resident explaining what life was like in the HDC back when it was operational. Really fascinating stuff. These buildings are being converted into apartments. I am so happy they are not being torn down. I asked my grampa about them. He said they had been used to house impoverished people during the great depression. That would seem to be corroborated in that the buildings really did house the center for dependent children back then. ive been here . its all bolted up. we got traped thin got out and got lost. I stayed at the Milwaukee County Childrens Home in the early part of the 1970’s for several years. the building was very large with porches attached to the back of the building, from behind the building you could see the milwaukee County Power Plant. The building was demolished years ago and tried to get information about this building from Wauwatosa Historical Society. I worked for a company housed in the buildings for several years (1996 to 2001). I believe that I worked in the most south west building. My dog would come with me many times and would go to the basement. I was told the housed animals in the basement at some point. You could smell hay in some other rooms during the summer. Also had some haunting experiences too. I never entered the tunnel to the other buildings, but sure wish I had now. They are amazing buildings and I hope the renovation goes as planned. Not sure why they took out the road…. I thought I read somewhere that these buildings are on the national registry of historical buildings. If that’s the case, how can they talk about razing them? in the last 30years some of the buildings were used as Wis DNR SE district HQ and also as the Milwaukee County University Extension Office. With all the current interest in urban agriculture, and the presence of organizations like Will Allen’s Growing Power, it seems to me very apppropriate to restore the buildings to a version of the original use as a school of urban agriculture, perhaps witth the help of the UW Madison College of Agriculture. No offense or disrespect, but the several of the Eischweiler buildings were in fact part of the home for dependant children,not just the current Milwaukee County Parks building. There were hundreds of children living there, of different ages, male and female. And my grandfather in fact lived there. You can find proof of this on the Milwaukee County Historical Landmarks listing. The children wore rags, the food was terrible, and there was a hospital wing for children who became ill (this is not to be confused with the tb sanitarium). Many children who fell ill also died there, from pneumonia to polio. My grandfather lived there, along with his 7 siblings. My great grandparents came here from Germany, dirt poor. And my grandfather has sad memories and stories that he’s shared with us, especially when we drive by there (my grandparents reside in Germantown, and I in Greenfield), because we pass them on the freeway when visiting each other. This is not to be mean or spiteful, just making a correction to a simple misunderstanding on your part. It was not just that one building that was the home for dependant children. I have recently been in on of the buildings in which we accessed through the tunnel system. We got to see the catherderal in the upper part of the buidling and even got a few photos. Since our visit the driveway has been chained off but we are planning a return visit. we only visited one building and it’s beauty and history is breath taking to say the least. Too bad vandals got to it. I can’t wait to revisit, signs say it’s under survelance but, if it is, it’s hidden very well. I always wished I could see the inside of the main building- kudos to ‘Secret’ for going through the tunnel system…. If I knew of this safe passage, I would be there tonight. DO NOT attempt to cross this property at any time- it now has alarms, as I found out the other night. It NEVER has been lit up at night before, but is pretty bright now and a very audible siren was sounded as soon as I put my foot on the grass of the North side (rear) of the admin building. Needless to say, we ran for our lives, back through the tear in the fence, down the steep seed netted, freshly graded hill and out through the construction entrance. No thanks. This property is officially OFF my list indefinitely. STAY AWAY from this place, unless you want to introduce yourself to some po po’s- no joke. Sadness, peeps….sadness. My mother grew up there from about 1944 to 1950?? Age 2-12. She actually has some funny stories but then she always looks on the bright side. I also lived at the children’s home from April 1956 to 1960 I’ve been trying to find someone I met there. I gave this person something to keep them safe. I have thought of this person often. if anyone has any pictures of the children in that time frame please reply! I as well resided at M.C.C.H in the late 70s. I would really like some help finding my records of registration and stay there. Update: As of 2014 the Mandel Group has purchased all of the buildings including 20+ acres. This area will be turned into apartment buildings to serve the surrounding medical complex. The Mandel Group has two different visions for the property, one includes keeping the buildings and renovating them the other will be keeping one building and using the remaining as “shells” to be used as walking gardens. The complex will also include a pool and other amentaties. The entire complex is currently being converted into condos. Construction and demolition is underway. The report I read in the local newspaper is that the administration buildings exterior is being preserved, and the building will serve as the condo office, gym, demo unit, and a party hall for the tenants. One buildings exterior walls only will be left standing, and a garden courtyard will be planted within its walls. The other buildings will be, and have been demolished. From what I can see driving by it about once a week, and what I remember from exploring the grounds, is a dormitory, large shop, and another larger shop/garage have been demolished. One would assume the tunnels have been filled in as well. The admin building is definitely standing and work being done inside. Another building still stands, but it is unclear of any work being done to it (that building slated for the garden perhaps?). While I roamed the grounds many times, I unfortunately never made it inside the buildings. Rumor had it that there were motion detectors within. Not only that, entry would only be possible by breaking and entering. I am too old to risk that nonsense. Just a couple blocks away is Potter’s Field, a former pauper’s grave site. Local reports (Google it – I found a Milwaukee Journal article on it) state that there are anywhere between 4,000 and 10,000 unmarked graves there. At times when construction occurs on this property, it is halted due to uncovering of human remains. The Ronald McDonald House expansion experienced this for certain (same MJ article). I find no evidence of the since built UW extension building and ABB building experiencing this (built right next to Eschweiller buildings in the last couple years). Great claims of hauntings in Potter’s Field, if you believe that stuff. My son swears it is, and even has a claimed EVP of a little girl. I personally hear nothing on the recording. Also on the site, is a memorial sign from where an asylum once stood. I’ve no history on that building, but recall peers 30 years ago claiming to have visited it. I’ve never seen the building, and no clue when it was removed…. The tunnels have been impassable more than twenty years. There wasn’t a chapel on the third floor of the administration building. It was a gymnasium. During the late nineteen-seventies through nineteen-eighties, several buildings were leased to companies such as Gammex. The orphanages (of which the Parks Dept Building remains) were located south of the poor farm. Only administration building remains intact. 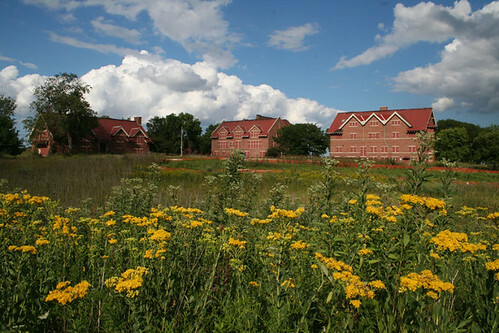 There were two insane asylums north of the present Ronald McDonald House location.